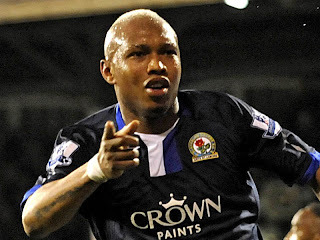 Former Teranga Lion of Senegal star, El Hadji Diouf has been arrested on suspicion of violent disorder after a brawl at a Manchester nightclub left a man with serious injuries. Anton Ferdinand who was Diouf's team mate in Sunderland in 2008/2009 was also interviewed by police under caution later on Sunday following the incident at the Circle Club. The 27-year-old QPR defender was not arrested. Diouf had arrived at 3am with wife Valerie and is thought to have suffered a facial wound and the Police are investigating whether a glass bottle was used in the incident. Former Liverpool, Bolton and Blackburn forward was bailed until May 23. Diouf now plays for Doncaster, who were relegated from the Championship on Saturday afternoon.